This is a very old post (2006), written by Sven Noben, founder of Signfuse. Several data (and links) in this article may be outdated. Geez, the last few months my inbox gets loads of annoying, poorly inspired letters. 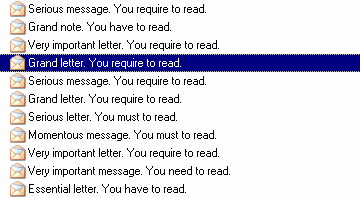 “You have to read”, “You require to read”, “You must to read”, “You should to read”. Spam, it’s the nightmare of every self-respecting internaut. Thanks to efficient Bayesian spamfilters, most shocking topics get filtered out. That’s why spammers try nowadays with boring keywords such as: “you … to read”. The word is changing to mislead the smart filters. During my 9 years online presence, I have heard about spam in about any language in the world. Thank god I haven\’t ever received spam in my mother tongue! My white, sweet language, shall thou remain thy innocence, takest mine eyes. But anyway, as technology gets cheaper, the chance to get a spam message in sign language in your inbox is getting closer. And your filters won’t block it out, or they will have to block any incoming video. But honestly, somewhere, I’m pretty curious how such a sign-spam would look like, just for once, for a good laugh! Would there be this woman explaining me in ASL how viagra works? Or would a Deaf man tell me I MUST buy a fake rolex? If he’s smart, he’s wearing a mask, not to get recognized by other Deafies. That’d be funny! Getting sign-spammed in sign language. The dark side of sign language media in the future… Let’s hope it never happens! Anyway, would it ever happen, anyone who has seen the first spam in sign language, email it to me straight away! I need a laugh!